If it hadn't been for a certain film, with a certain ship and a huge number of weeping teenagers, Jerry Goldsmith might well and probably would have walked away with his second (wow!) Oscar. Sadly, the Titanic hoopla relegated this superb film and score into the background somewhat, a shame to be sure, but as it was greatly appreciated by Goldsmith's legion of admirers, those who count liked it and that's all that matters. The fact that it was perfect in the film as well helps a great deal. From the ticking opening synth beat, to the battering percussion later in the cue and the thundering brass to the sultry jazz intoned selections later on, the score captures both the brutalness of certain sections of the score as well as the period of the film. The aforementioned opening cue, Bloody Christmas accompanies a vicious prison riot, although it is not contained by the police, but provoked by them. This sets the scene for the complex tail of police corruption and the attempts by slightly nerdy new boy Guy Pearce (he from Neighbours - have to start somewhere I guess) to uncover the real truth. Admittedly, much of the rest of the score is a lot more subdued than the exhilarating opening which goes through the frenetic timpani blasts to a high string motif to then suddenly melt away into a gently jazz inflected motif; this is the main feeling that pervades the score. This isn't an action thriller per se, more of a police corruption thriller that has action as part of the territory. The most notable motif is a five note syncopated trumpet figure (played with style by Malcom McNab), however the more canny and widely listened audiophile will notice a stringing similiarity between this figure and some music that Leonard Bernstein wrote for On the Waterfront. It's not one of Bernstein's most famous efforts and I hadn't heard of it beforehand, but the theme is quite strikingly similar. Ah well, if glove fits, wear it. It has to be said that there are a few cues which contain sections of not entirely exciting synth and suspense motifs, but these are usually added onto with the orchestra, most notably high strings and the langorous McNab trumpet playing. Track 2, The Cafe is a prime example. I heard the opening 30 seconds and wondered if this wasn't as great as I thought it was, but once it gets going, it's a great cue. I think that some younger Goldsmith fans (myself included, to start with at least) didn't really appreciate Goldsmith's score; it's so much more gritty, edgy and minimal than we're used to. However, it is scores like this that cemented his reputation as one of the finest composers for film of this century and while this perhaps isn't as great as scores such as Chinatown, it is still an interesting modern take on a side of Goldsmith's writing that has not been touched upon for many years. This is a typical half hour Varese release, but there wasn't a great deal of extra music in the film and many of the cues were a lot shorter than presented here and so I would suggest this makes for an ideal sampling of the score. A lot of the film was filled with appropriate period songs, which rather than be placed just for a quick buck were actually ideal in setting the period whereas Jerry's music helps to follow the drama. Listen to it (like the similar, but much earlier Contract on Cherry Street) more than once to get a flavour for the score and to recognise the major motifs clearly. This is not themeless or meandering, but well written and dramatic music that has to be heard carefully to be fully appreciated. 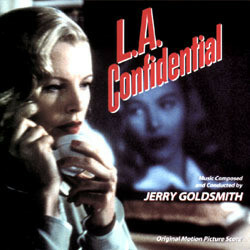 Goldsmith's Academy Award nominated score for the excellent film L.A. Confidential is very dark, and doesn't exactly offer a great and enjoyable listening experience - although the score worked great in the film, I may add. The majority of the score concists out of rumbling piano, synth and percussion, with occasional splashes of more lyrical and soft music, often dominated by slow trumpet solos, that doesn't seem to lead anywhere. But that doesn't mean that the score is without high points. The first track, "Bloody Christmas", for example, is a superb mood setter, with it's furious percussion - mostly timpani - and dramatic dissonant strings, that softens after a while, and the lonely main theme is heard instead, for the first time. The last cue, "The Victor", is also one of the scores' highlights, which features a wonderful rendition of the main theme performed by the entire orchestra, backed up by synths and piano. The album is rather short - just under 30 minutes - but I have to admit that I think that is enough. A longer release would have been tiresome listening to. And it's important to remember that there wasn't much score in the film, which had a soundtrack dominated by songs, in the first place.